The Burmese Star tortoise Geochelone Platynota is a large tortoise. These are a critically endangered species. They are inhabitants of deciduous dry forests of Myanmar. The Burmese star tortoise is very near extinction in Myanmar, since the native Burmese people eat them. They also export them to the Chinese food markets. Not much study has been done on this species and there is little knowledge about their behavioral ecology in their wild state. You can find them in the forests as well as the forest edges in the dry regions of central Myanmar. Burmese stars are diurnal reptiles. They are active in daytime when they search for prey. During the warmer part of the day, they prefer to rest in the shade. They feed on vegetation, primarily grass and mushrooms. They also eat fruits and possibly larvae and insects. Among all the tortoises that possess the characteristic distinctive star or radiating pattern on their upper shells, the Burmese star tortoise stands out as the rarest and the most beautiful. The domed carapaces (upper shell) vary in color from dark brown to black. They display radiating yellow colored stripe patterns that seem to emerge from the central areas. This provides the star pattern which gives the tortoise its distinctive appearance and name. The plastron (lower shell) color ranges from yellow to tan. Each scute has a black or dark brown notch. The color of the head, tail and limbs, is yellow. There is a large, horny, scale at the end of the tail. You can distinguish the males from the females by their longer, thicker tails. You can also distinguish the Burmese stars from the more common Indian stars by comparing the plastrons of the two. Nesting reportedly happens in February end. In captivity, the female tortoise lays four to five eggs in a clutch. Captive breeding of this species is quite difficult. 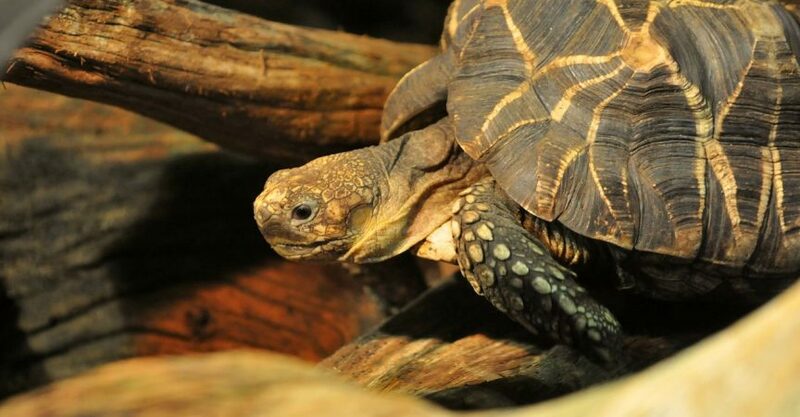 The honor of the first successful breeding in captivity goes to the Taipei zoo in Taiwan, where they successfully hatched Burmese star tortoises in the year 2003. The IUCN has listed the Burmese Star Tortoise as a critically endangered species. In spite of this, people widely consume these reptiles and also export to China’s food markets. There was a recent expedition in Myanmar which looked for Burmese stars in their habitat. The search, which lasted for 400 hours, could locate only five tortoises of the species. Getting a Burmese star as a pet can be a quite expensive proposition. Compared to the Indian star tortoise, Burmese stars are definitely more robust. They do well in captivity. Being quite expensive, not many can afford to keep a Burmese star tortoise. They are also a highly endangered species. You can support tortoise conservation efforts by buying only captive bred star tortoises. Burmese stars are primarily herbivores. They may occasionally feed on animal matter. A 100% vegetarian diet ideal for captive star tortoises. You must not give them animal products like cat and dog food. You must avoid giving too much sweet foods, including fruit to these tortoises. They may cause colic, increase the number of protozoa and other problems. Ideally, 90% of the diet should consist of grasses and greens that are rich in fiber. Coarse leaves, dark greens, weeds and mixed grasses as well as succulents should constitute the bulk of the star tortoise’s diet. Burmese Star tortoises seem to have a preference for broad leaf weeds compared to grass. It is very important to give your tortoise a diverse diet. Offer a large variety of food items. Do not depend on grocery greens only. Use them as a secondary food source only. You can mix grocery store greens with salad, hay (dried) or dried weeds to increase the fiber content. Sedum is generally safe for tortoises. Avoid Sedum acre (a plant that flowers perennially) as they say it has a toxic content. You can feed babies and the young ones twice a day. You should give them their main meal during the day when they are most active. You can give their afternoon snacks during their second active period. This will simulate their eating patterns in their free state. You can also feed the adult tortoises every day. You can also skip feeding them snacks once or twice a week. Even on those days, you can leave some chopped salad, hay for them in case they need a snack. The ideal diet should be high in fiber, low in protein and fat. If and when weather permits, you can keep the youngsters and the hatchlings outdoors, just like the adults. If your tortoise has only a limited access to a large enclosure, you should create an indoor pen that is as large and as natural as possible. Tortoises spend hours a day walking, exploring and searching for food. Captive tortoises should ideally spend more time outdoors than indoors. You certainly can be creative and have lots of fun when you design an enclosure for your tortoise. Just make sure that it is secure, has the proper lighting, temperature and humidity. 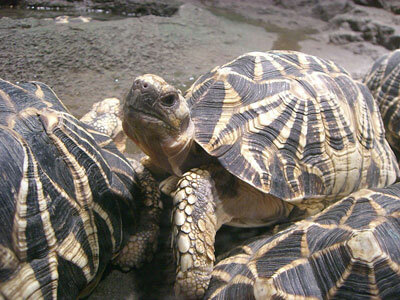 Open topped, extensive enclosures are suited for sub adults and adult tortoises belonging to dry areas, like Burmese star tortoises. Half-closed or fully closed enclosures ideally suit the babies. Such enclosures retain heat and humidity better. For an enclosure you can choose a tub that is long enough to accommodate a temperature gradient that has warmer and cooler ends. If your tortoise does not have much of an access to an outdoor enclosure, you should provide a UVB light when your pet is indoors. You can use either a Mercury Vapor Lamp (MVB) or a fluorescent UVB tube. • You must provide daytime heating with a Basking Bulb, either a heating bulb or UVB. • You can provide additional heat if necessary using ceramic heat emitters or radiant panels. • Take care to maintain darkness in the enclosure at night. • The commonly used substrates are plain soil, coconut-coir sand mix, soil and sand mix, fir orchid bark, cypress mulch and damp paper towels for hatchlings. • Common substrates used for hides with humidity are Coconut coir, sphagnum moss and wet paper towels. • Under the basking bulb, you must make sure of temperatures between 85-95+ degree. Adults can bear more basking temperatures than babies. • They must have 70+ degree F at night in dry conditions and 75+ degree F in damp conditions. You must maintain humidity between 40 to 70 degrees.